Joshua Waller reviews the new 16 megapixel Sony NEX-5N APS-C Mirrorless camera. 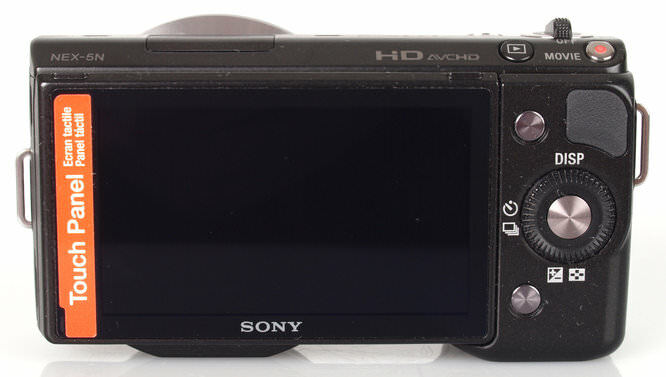 The Sony NEX-5N is an update to the NEX-5 - it gives the camera a new touch screen giving easier control of options, as well as an updated 16.1 megapixel sensor, and the ability to add an electronic viewfinder. The electronic viewfinder is rather unique in that is features an OLED screen with 2.359million dots! 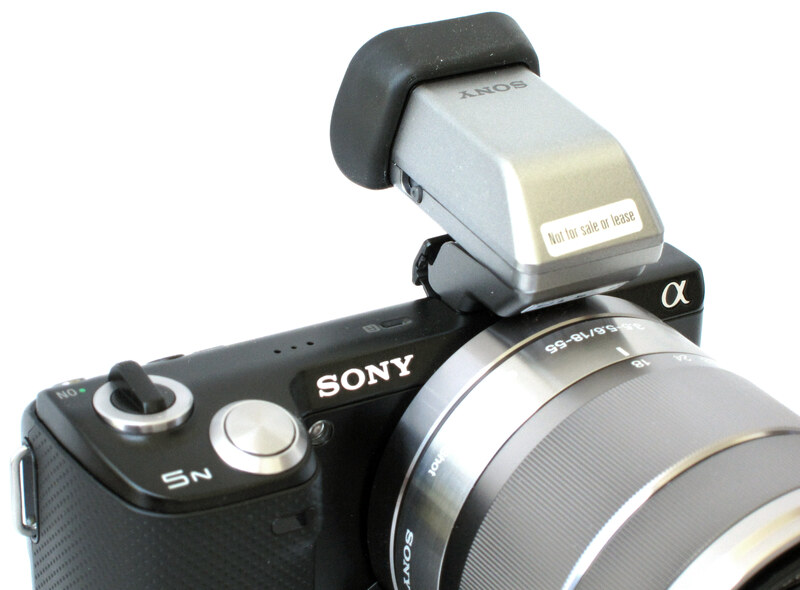 There's also a new Sony Alpha adapter, the LA-EA2, with translucent mirror technology, it provides high speed auto focus with Alpha lenses, and features a built in motor for lenses without built in motor. 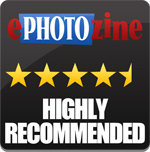 For more information have a look at our NEX-5N First Look Review. With the new adapter, you can add great lenses such as the 35mm f/1.4 G lens and get extremely quick focusing on the NEX system. 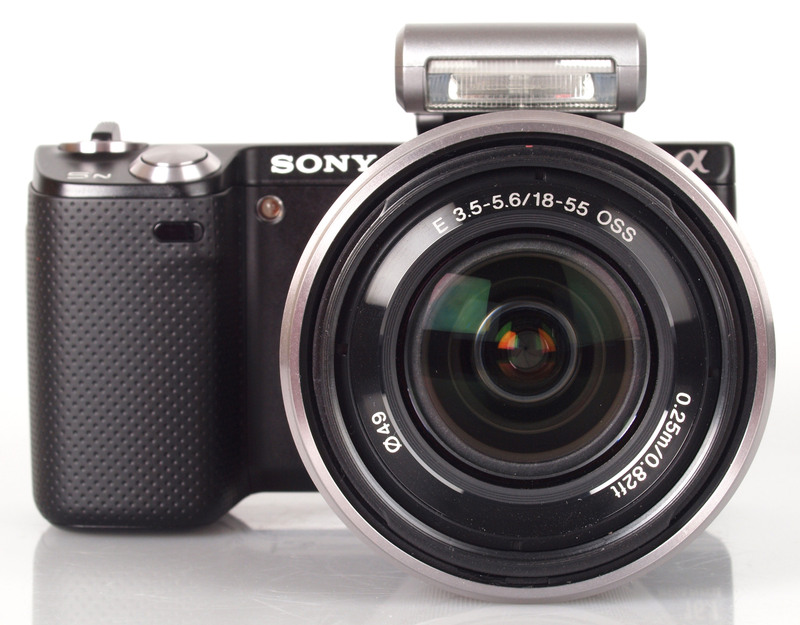 Sample photos taken with the Sony NEX-5N and 35mm f/1.4 G Lens can be viewed in the equipment database. The touch screen gives an alternative way to control the camera and can provide quick access to options and settings, letting you scroll through the menus quicker. playback is also quicker to control, and the ability to flick through photos, and drag the image around when zoomed in, makes it very similar to the way iphones and other touchscreen smartphones work. Touch screen lets you choose the focus point using your finger, then AF tracking can keep the choice in focus. The shutter sound is quite loud. New OLED Electronic ViewFinder (EVF) - with 2.359 million dots the extremely high resolution electronic viewfinder gives an excellent view of the subject, and is of a higher resolution than the 921k dot screen. Although the screen does work very well outdoors in bright sunlight, there are times when it is difficult to see and the EVF helps massively in this respect. Battery life is improved with a battery life rating of 410 shots. 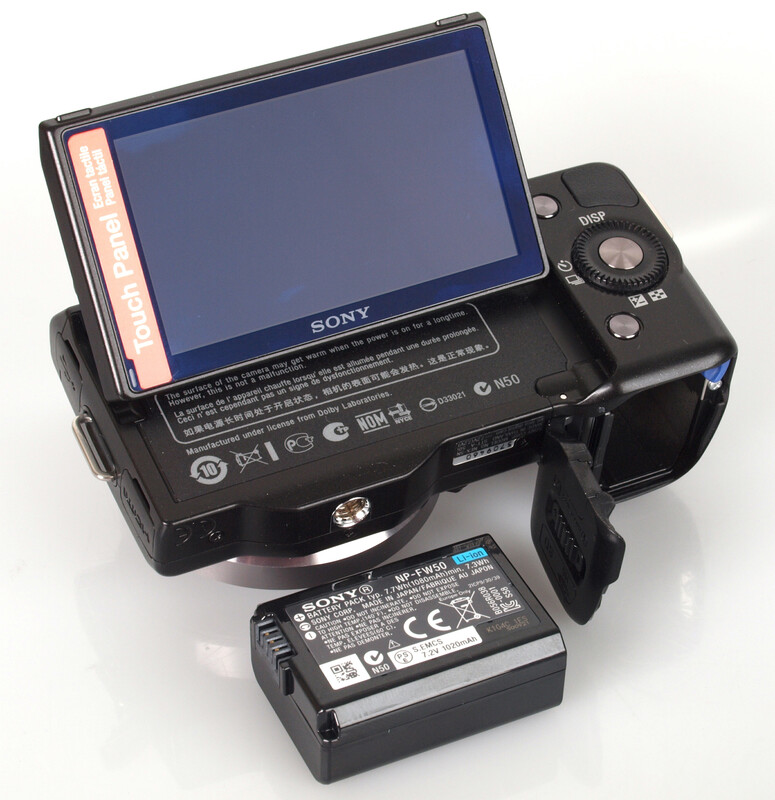 In our testing we took over 220 shots and the battery life was showing as having over 50% available, this is an improvement over the Sony NEX-5 who's battery life was rated at 330 shot. 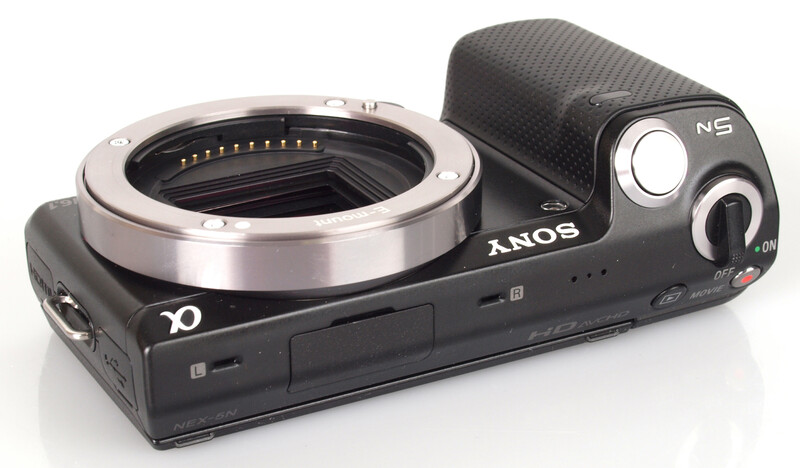 Speed - we tested the Sony NEX-5N, and compared it to the NEX-C3 and Samsung NX11. You can also compare the results to the new Panasonic Lumix G3, and Olympus PEN E-P3 as well as others. The speed has improved over the NEX-C3 and NEX-5 with quicker focus, shutter response, and much quicker continuous shooting at 10fps. Shot to shot was also very good even with flash on. Sample photos show very little red eye in the portrait photo and there is good detail. Colours are bright and saturated and detail is generally good. HDR mode helps expand dynamic range, keeping detail in the shadow areas and highlight areas. Lens test images show good detail in both the wide angle and telephoto shots. There is very little chromatic aberration or purple fringing, but where there is some it is not excessive. Macro performance is reasonable for a kit lens giving the ability to take some detailed close up photos. ISO test images show some pincushion distortion. At ISO100 all the way to ISO1600 noise is very low. At ISO3200 noise starts to become visible, and images become slightly softer. ISO6400 shows more noise, but detail is still good and the results are very usable. Although at ISO12800 and above noise is the most prominent, and images may be best used resized on the web or processed further to reduce noise more. White balance images show the camera performing well using Auto White Balance under fluorescent lighting, although better results are available under tungsten lighting by using the tungsten preset. Detail is good in these photos thanks to the higher resolution sensor. Panoramic 1/200 sec | f/10.0 | 18.0 mm | ISO 100 - The sweep panorama mode works well where you simply press the shutter button and rotate with the camera. The camera will stitch the photographs together automatically. Digital Filters - there are a number of filters and effects available, with the choice of: Toycam, Pop, Posterization, Retro, Soft High Key, Partial Colour Red, High contrast mono, Soft focus, HDR painting, Rich Tone Mono, and Miniature. On the roadmap for 2012 is the addition of a "High Performance Standard Zoom Lens (G)", a wide angle zoom lens, and a mid telephoto prime lens, bringing the total number of lenses available from Sony up to 10 lenses. More sample photos taken with the Sony NEX-5N: have a look at samples taken with the new Carl Zeiss 24mm f/1.8 Lens, new Sony 50mm f/1.8 OSS lens, and the new Sony 55-210mm OSS Lens. 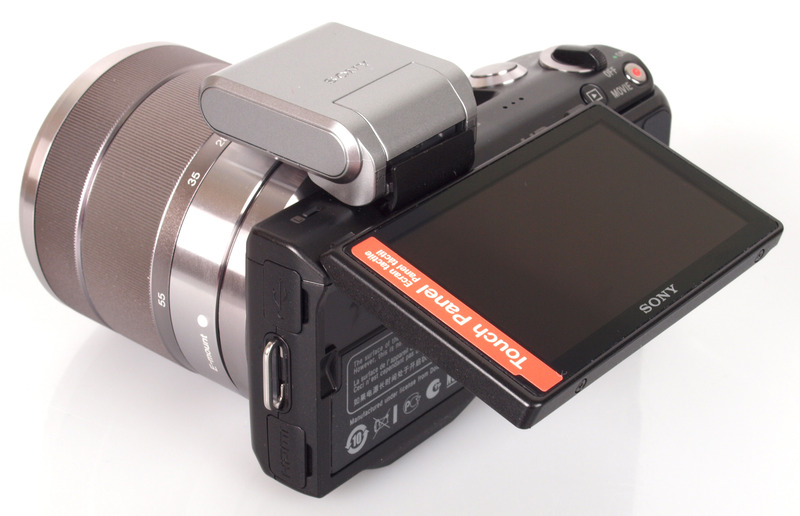 Video - The NEX-5N features Full HD, stereo sound, AVCHD, and high quality video recording, with full manual controls, P/A/S/M. The Sony NEX-5N is available for £539 with the 18-55 kit lens with OIS, or £609 with the both the 18-55mm and 16mm pancake lens (without OIS) making it quite good value for money. Alternatively you can find the Sony NEX-5 with full HD for around £378 with 18-55 kit lens, or the NEX-C3 is available for £385 with kit lens. Alternatives include the Olympus PEN Lite E-PL3, E-P3, Panasonic Lumix G3, Panasonic Lumix GF3, Samsung NX11, as well as earlier models, the Panasonic Lumix GF2, and Olympus PEN EPL2. Of these, the Olympus PEN cameras feature a built in anti-shake sensor, and both the Panasonic and Olympus models use the micro four thirds mount, with the largest range of lenses available. 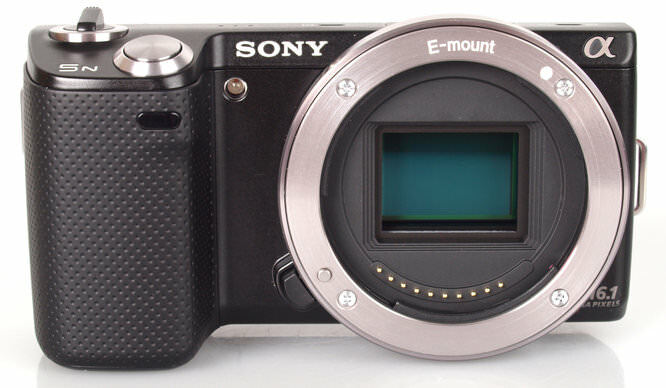 More options available in our mirrorless reviews. The Sony NEX-5N and additional lenses, viewfinder, and new adapter give the NEX system added versatility, and a much more useful range of choices regarding lenses. The touch screen is an improvement in the way the NEX-5 is controlled as it helps make up for the limited number of buttons on the original NEX-5, aids access to options, and ultimately makes it an easier camera to use. It also makes it a more fun camera to use, particularly when viewing photos. The optional viewfinder is extremely impressive, with stunning detail and colour, although the addition of the EVF does stop you from using flash. Image quality appears to be excellent, and even though megapixels have increased, the camera is still providing low noise levels, with the addition of a new ISO25600 range giving additional usefulness in extremely low light. The new 50mm f/1.8 Portrait lens also helps in low light. This could be the best NEX and whilst a subtle update, it gives quicker performance in use (including an impressive 10fps shooting), better battery life, higher resolution, touch screen aids control and there are new lenses available, which will be especially good news to anyone who has already bought into the NEX system. 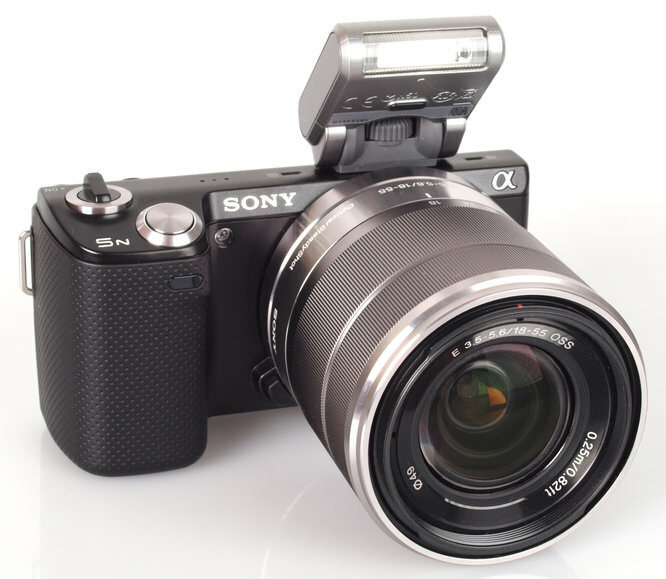 The Sony NEX-5N improves on the NEX-5 giving speedy performance and great image quality. The high ISO, above 1600, is fantastic, far better than my Nikon D90 or any of my M4/3 cameras. I figure a NEX3, a NEX 5N. With 3 lenses, 16mm, 18-55, and 55-210 weighs about what my D90 with the 18-200 lens and is not nearly as flexible. I have a back up camera mounted with the 16mm and the 18-55 on the 5N and I am ready to meet any situation in my travels. Great review, super little camera with a top notch performance, but these add on EVF's are so vulnerable to rough handling and accidental damage. Yes, I know it would make the camera bigger, but a built in EVF would be the icing on the cake for me. Sony must be the the class leader in CSC's, especially as its also a APS-C sensor camera which has less 'compromises' than a Micro 4thirds. The NEX 7 must have heard my complaints. I wonder if there is much improvement in picture quality from 16mp to 24mp. Great small body, great IQ, then it is spoilt as soon as you put a lens on! The micro four thirds systems may not have the same high ISO performance but they do have the better compact lens. One of the main points for these camears is the compact size and low weight over a normal DSLR system. The NEX 5N when paired with a 18-55mm lens is neither compact or that light. Better to have a little less ISO performance and something you can easily fit in a coat pocket than a larger camera that ends up being little better than a DSLR. Great small body, great IQ, then it is spoilt as soon as you put a lens on! The micro four thirds systems may not have the same high ISO performance but they do have the better compact lens. One of the main points for these camears is the compact size and low weight over a normal DSLR system. The NEX 5N when paired with a 18-55mm lens is neither compact or that light. Better to have a little less ISO performance and something you can easily fit in a coat pocket than a larger camera that ends up being little better than a DSLR. Mike I have travel to India and Cuba with the 5 N with the EVF attached and in my vest pocket. Oh, the lens I mainly use is the 18-55 and that is also attached and in my vest pocket. I have travel to India and Cuba with the 5 N with the EVF attached and in my vest pocket. Oh, the lens I mainly use is the 18-55 and that is also attached and in my vest pocket.